Downstairs suite: A large one bedroom suite with a living room and panoramic ocean views, fully equipped kitchen and large bathroom with hot water, a/c, wifi, comfortable furniture, ceiling fans and an ocean view patio with hammocks and outdoor furniture. Two queen beds and one single bed. Located in Costa Rica, on the southern tip of the Nicoya Peninsula, in the province of Punta Arenas that borders the province of Guanacaste, Santa Teresa Surf Vista Villas started construction in 2008 and opened in 2009. It’s been our dream to welcome people to this special area and share the adventure and passion we have for Costa Rica nature and surfing. 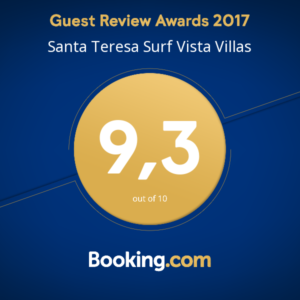 We´re proud to offer this experience for our guests that travel from all around the world to enjoy our ocean view villas and peaceful hilltop location. In our quiet surroundings you will connect with nature watching the monkeys, birds and other types of wildlife that live in the Surf Vista Villas jungle we love. Isla Tortuga (also written as Isla Tortugas) is the name to an island of of Costa Rica, which is located in the Gulf of Nicoya on the Pacific Ocean coast in front of the Curu Wildlife Refuge very close to the peninsula of Nicoya. 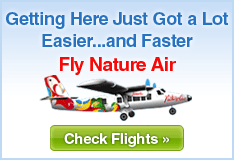 If you are a fun or snorkeling or scuba diving this will be a must on your vacation. The tour starts with a 45 minute scenic boat ride from Montezuma to the pristine Isla Tortuga. You will swim and snorkel with the local sea life, then have a BBQ lunch on the withe sand beach and enjoy the nature around you. Surf Vista Villa located a serene setting on a hilltop, surrounded by the jungle canopy and with exquisite sea views. The alluring boutique hotel features six suites with panorama windows and 180º ocean views, to Playa Santa Teresa’s, surfing, tropical jungle canopy, and surrounding mountains. Santa Teresa is a great place for enjoying wonderful sunset views. Situated in the southern tip of the Costa Rica Nicoya Peninsula. Santa Teresa has quite a few different sunset-viewing options. Mal Pais, Playa Carmen, Playa Hermosa yPlaya Santa Teresa. The sunsets here are incredible, regardless of where you choose to view them. Just enjoy gazing at the amazing sunset view and the sky light turning into different colors. Surf Vista Villas boutique hotel in Santa Teresa have beautiful sunset views from the rooms and pool. We recommend using these links below to assist in your travel needs. We´re located on a small private hilltop with no neighbors except for the diverse wildlife Costa Rica. We are conveniently located just outside the hustle and bustle of the downtown area of Mal Pais / Santa Teresa. Your options for traveling to Surf Vista Villas boutique hotel from San Jose Airport range from public buses, private taxis, shared mini-buses, to rental cars and even a quick flight. The travel time is all the same – approximately 2 hours from the airport to Puntarenas, 1 hour on the ferry, and then 1.5 hours from Paquera to Santa Teresa. © 2018 Copyright by Surf Vista Villas.com. All rights reserved.